What has transpired since Wikileaks was founded in 2006, there have been several massive troves (10 million) of documents posted for public consumption. Assange began hacking in 1987 under the name of Mendax. 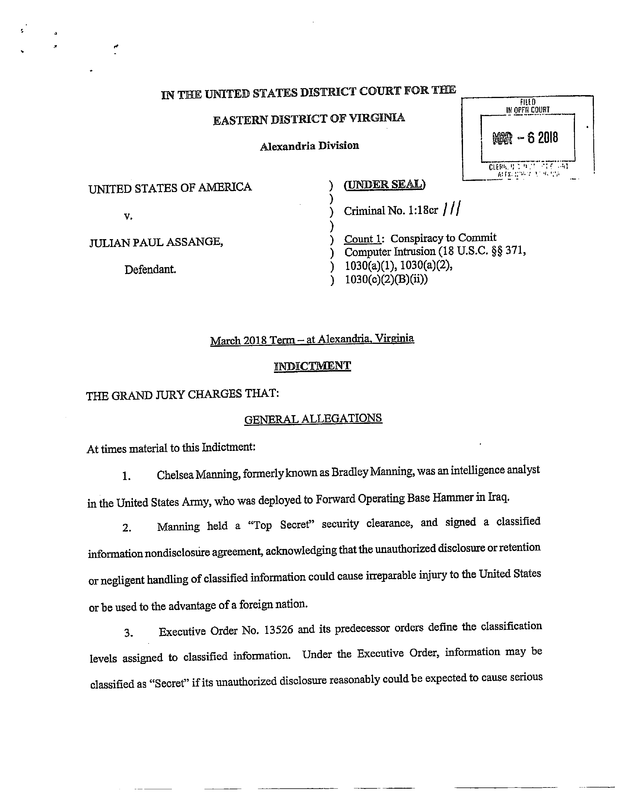 It is not known officially how Julian Assange and Bradley Manning became acquainted, however during the court-martial of Manning, a volume of chat logs were presented as evidence between the two and included how Assange gave Manning the ability to reverse engineer passwords. President Obama gave Manning a pardon while the matter of Assange could be that of a co-conspirator, espionage or aiding and abetting. The indictment does give rise to the evidence beyond the protections of Assange of just being a journalist. Assange is being prosecuted for violating the ‘computer fraud and abuse act’. President Lenín Moreno of Ecuador, who became the country’s president in 2017, had looked for a face-saving way to get out of the arrangement. On Thursday in a Twitter post, he said that his country had decided to stop sheltering Mr. Assange after “his repeated violations to international conventions and daily-life protocols,” a decision that cleared the way for the British authorities to detain him. Mr. Moreno, in a video statement, said that Mr. Assange had exhausted the patience of his hosts, outlining of litany of grievances: the installation of electronic interference equipment, the blocking of security cameras, and attacks on guards. In December 2017, Ecuador gave Mr. Assange citizenship, and was preparing to appoint him to a diplomatic post in Russia, but the British government made clear that if he left the embassy, he would not have diplomatic immunity. The Ecuadorean government said in March last year that it had cut off Mr. Assange’s internet access, saying that he had violated an agreement to stop commenting on, or trying to influence, the politics of other countries. The government also imposed other restrictions, limiting his visitors and requiring him to clean his bathroom and look after his cat. He sued the Ecuadorean government in October, claiming that it was violating his rights. More here from the NYT’s. Posted in Citizens Duty, Cyber War, DOJ, DC and inside the Beltway, Google, Media corruption, Presidential campaign, The Denise Simon Experience, Wikileaks Podesta Emails.